This essay originally appeared on ActiveHistory.ca in September 2016. Maybe you read some of the recent news articles: “The First Americans Didn’t Arrive by the Bering Land Bridge, Study Says.” “A Final Blow to Myth of How People Arrived in the Americas.” “New Study Suggests Route of First Humans to North America was not Western Canada.” Maybe you read some of the social media responses to those articles: “Finally! The Bering Strait theory shot down!” “OMG heard on the CBC that Bering Land Bridge Theory – one of my very favourite theories – has been discredited.” “Scientists say first North American humans did not cross the Bering Straight ice bridge after all.” And maybe, since you’ll soon be teaching or TAing a Canadian history survey course and will almost immediately come up against the question of how to talk about the peopling of the continent by the ancestors of today’s First Nations, you think you will have to radically rework that section of your notes. Despite a lot of breathless commentary, the new findings published in the journal Nature by a team of paleogeneticists do not actually overturn much of the scientific consensus on how the Americas were peopled. It is still accepted that during the last ice age, ocean water fed the ice sheets, which meant there was less water in the oceans, which meant sea levels were lower, which meant that the continental shelf between Siberia and North America became exposed, creating what has become known as the Bering land bridge, or Beringia. It is still accepted that mitochondrial DNA of present-day First Nations contain genetic markers that only began to be found in Siberian people about 20,000 years ago, suggesting that the Americas could not have been populated before then. It is still accepted that the Monte Verde, Chile archaeological site discovered in the 1970s is the earliest evidence of human settlement in the Americas, dating to about 14,500 years ago. It is still accepted that the first peoples utilized the Bering land bridge to reach this hemisphere. The only thing the article overturns is how exactly they did so. It puts to bed once and for all the theory that they walked from Alaska to Montana through the ice-free corridor that opened up between the Cordilleran and Laurentide ice sheets 14-15,000 years ago. The geneticists found no evidence that the corridor was habitable until 12,600 years ago, well after the archaeological record states the hemisphere became populated. Perhaps the most important recent critique of the Bering land bridge theory – important especially because of the attention it has received online – is Alex Ewen’s 2014 six-part series in Indian Country Today. Ewen is the co-author of the Encyclopedia of the American Indian in the 20th Century and the longtime director of the Solidarity Foundation, a research organization working on behalf of indigenous people. It is difficult to find evidence of the foundation’s existence online, but with some sleuthing I was delighted to discover that it had been created by Steven Van Zandt in 1985. Ewen’s series usefully dissects the racist backgrounds and ambitions of some of the Bering bridge theory’s leading advocates in the 19th and 20th century. (Bizarrely, though, Ewen also quotes approvingly Dennis Stanford, whose theory that the Americas were first settled by people from Europe has been embraced by white supremacists, as you might imagine. [ii]) Ewen does not, however, debate the Bering theory’s existing formulation, let alone offer an alternative theory for the settlement of the Americas. Reactions such as this to the Nature article are concerning. They suggest a too-quick willingness to read an attempt to improve a theory as grounds for undercutting the theory’s underlying validity – as grounds for throwing the baby out with the bathwater. This has long been evident in climate research, of course, where climate change deniers have been quick to use any debate within the science to suggest that the jury is still out as to whether global warming is even happening. (Psst: global warming is happening.) There is something oddly pleasurable in upending existing conventions, and it is certainly part of our disciplinary make-up to be open to new interpretations. But we should not be too quick to mistake revision for revisionism. Alan MacEachern is Professor in the History Department at Western University, where he teaches & researches Canadian history, with an emphasis on environmental & climate history. [i] While Canadian history textbooks – at least in the editions I had access to in writing this post – do not tend to offer specific archaeological evidence that predates Monte Verde, they all reference archaeology in suggesting that migration began much earlier. Bumsted’s A History of the Canadian Peoples (2011 ed.) refers to “the 30,000 years or more” of human occupation of North America (4). Conrad and Finkel’s History of the Canadian Peoples (2003 ed.) speaks of “various waves of migration from 30,000 to 10,000 years ago” (8). Lux in Visions (2011 ed.) states that arrival occurred “somewhere between 40,000 and 12,000 years ago” (5). Blake and Keshen’s Narrating a Nation (2011 ed.) puts migration from Asia as “between 55,000 and 18,600 years ago. Generally, most genetic evidence points to a date approximately 25,000 years ago” (5). 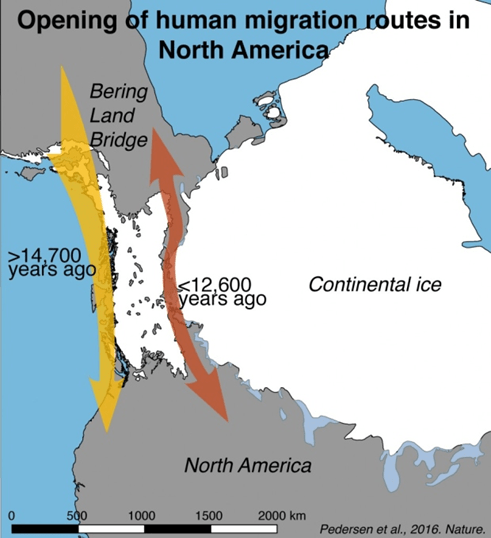 The sixth edition (2009) of Francis, Jones, and Smith’s Origins: Canadian History to Confederation note only that the first people crossed on the Bering land bridge, which existed 70,000 to 14,000 years ago. However, they then somewhat contradict their own timeline by stating “Scientists disagree as to when the migration from Siberia occurred. Supporters of the more controversial claims contend that humans possibly entered the Americas as early as approximately 100,000 years ago….” (3) Wardhaugh, who came onboard the seventh edition of Origins (2013), states migration occurred “at least 40,000 and possibly even 50,000 years ago” (4). I have joined Wardhaugh for the eighth edition (forthcoming), and argued successfully to remove this language, focusing instead on the more specific dating that Monte Verde offers. But we are still toying with the wording. I’ve discovered that textbooks are like laws and sausage: it’s better not to see them being made. [ii] It is likewise strange that the 2011 edition (at least) of Bumsted’s Canadian history textbook includes a text box devoted to Kennewick Man, a 1996 skeletal discovery in Washington state that its anthropologist discoverer, James Chatters, originally dubbed “caucasoid” – a claim that was similarly embraced by white supremacists. (A facial reconstruction, shown in Bumsted’s book, famously resembled actor Patrick Stewart.) Chatters had retracted his assessment well before 2011, and in 2015 DNA evidence proved that Kennewick Man was in fact related to contemporary Native Americans of the area.